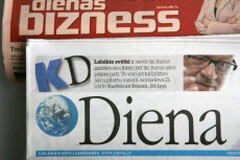 The newspapers Diena and Dienas Bizness have been acquired by the Rowland family in England, as the joint-stock company Diena board chairman Aleksandrs Tralmaks informed the newspaper's editors today, Internet portal "diena.lv" reports. The Rowlands had provided a loan so Tralmaks' company Nedela S.A. could buy said newspapers. Now the loan has been restructured and Tralmaks is no longer the owner of these two newspapers, writes LETA. Tralmaks said that he would continue as the board chairman of Diena and he would be in charge of the company's further development. Tralmaks though did not present any documents proving the transaction, and said that journalists should turn to the new owners of the newspapers. The Rowland family, led by Jonathan, 33, and his father, David, 66, was ranked 66th in the "Rich List" of the "Sunday Times" this year with their wealth worth an estimated GBP 639 million. The Rowlands own the property and investment group Rowland Capital. A few years ago, Jonathan Rowland said in an interview to "The Independent" that his goal was to set up investment companies specializing in buying out troubled and undervalued companies. The Rowlands recently entered the banking business by establishing a new company on the basis of the Icelandic group Kaupthing that they acquired after it went bankrupt. The Rowland family is one of the largest donors to Britain's Conservative Party.